The biggest game in Texas Tech Football history, again, and the biggest college football game all season is tomorrow against the #5 Oklahoma Sooners. Here's a little numbers rundown to show you how big of a game this really is. Doctors like to say the best indicator of future performance is past performance, but then again, people were skeptics when we faced Texas and Oklahoma State. Having watched the two face-off in Norman in '04, it's a difficult place to play. This is the best, most balanced Texas Tech team in the 8 years I've watched Tech. It's going to be a great game. Sometime during four interviews in five days, I had a six hour hiatus while in Wahsington DC to experience the Smithsonian Air and Space Museum and a few national monuments. As usual the picture to word ratio is high for this blog entry. 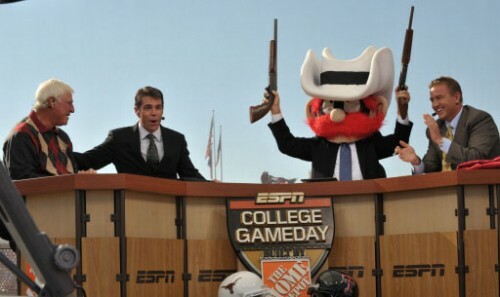 Here's a little something to get you excited about this Saturday, when ESPN College Gameday visits Norman, OK for another incredible Texas Tech victory against a Sooner team that's 60-2 at home. Before this Saturday, my vote for best college football game I attended would be a close race between beating Texas A&M 48-47 in OT in 2002 at Kyle Field and watching Chris Simms crumble as he through a pick during a late 4th quarter drive, dashing National Title hopes. This past Saturday was better than the two combined, as Texas Tech upset the #1 team in the nation and climbed to #2 and #3 in the polls and #2 in the BCS standings, once again putting Longhorn supremacy in question. Texas Tech has had many chances for defining itself as a power house and has even pulled out many upsets against major teams as in 2002. However, consistency has chronically plagued the Red Raiders, combined with a lack of defense and a game strategy unable to overcome multiple interceptions from rookie quarterbacks. Texas Tech had the chance to change that Saturday night and succeeded. Texas Tech holds its own destiny, and will undoubtedly contend for the National title and the Heisman trophy if they can win out. That's a big if when you consider they still have two top 10 teams and a possibly a Big 12 Title game left. No matter the outcome though, Texas Tech has vaulted itself into the national spotlight, in what is major progress for the program, stadium renovations and future prospects. Tech has always been known for its offense, and this game will go down in memory as being won by a miraculous Crabtree game winning snag. The untold story though, is that this game was won by dominating the offensive and defensive line, pressuring Colt McCoy, 9 defensive points from a interception and safety, and rushing for over 100 yards. Texas Tech football is more rounded than it has ever been. Except special teams, of course, which now has hope with Matt "kick for rent" Williams. Go Red Raiders! Here's a pic of friends and I on the field after the game was really over. Not the first two times. In what is probablly the biggest game in Texas Tech football history, the Texas Tech Red Raiders (6) host the Texas Longhorns (1) this Saturday. 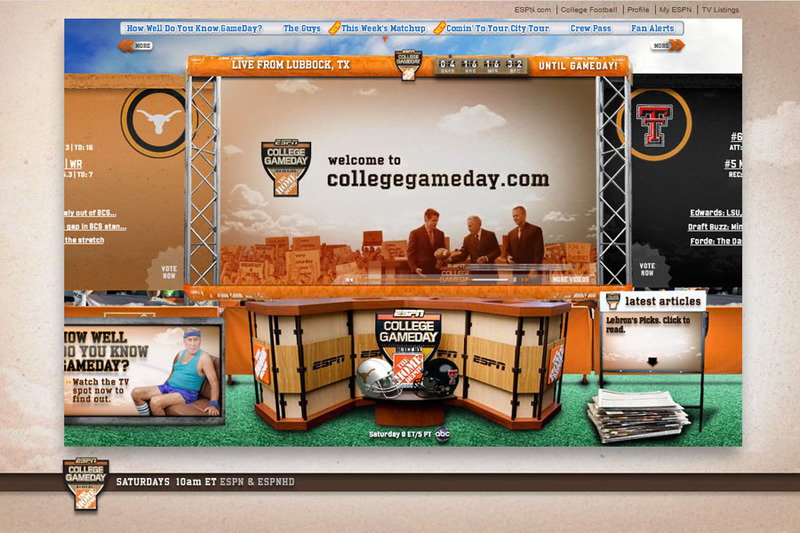 Just as epic is the quintessential college football show, ESPN College Football Gameday, who will make its first appearance in Lubbock, TX. If you're not familiar with the show, one of the analysts, Lee Corso, is known for his over dramatic pick of the Gameday winner. This usually involves him wearing the head of the mascot's costume as below, a tradition that began with an impromptu donning at an Ohio State game. 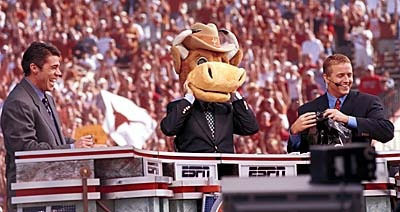 So the questions remains, since Texas Tech doesn't have a traditional "mascot", what will Lee Corso sport in honor of the underdog Texas Tech Red Raiders? What do you think?